Over the last week or so I have been working on the left hand side fender. The Fender (front wings), was not secured in place properly when I got the car and the undercoat was flaking off. To stop rust eating the metal away from the inside out, I decided I would treat the fenders as I did the trunk (boot) area. I removed the fender and wirebrushed the flaking rust and underseal off. I treated the bare metal with POR Prep & Ready, applied the POR15 Rust Prevention paint in two coats. In these first few pictures I have removed the old paint and rust down as much as I needed in order to get a good key for the paint. Applying the POR15 Prep & Ready requires the metal to be wet for at least 30 minutes. You then have to rinse of and the entire area MUST be completly dry before the rust prevention paint is applied. I then applied the first coat of POR15 Rust Prevention Paint to the metal once the POR15 Prep & Ready had been rinsed and dried. The second coat was added twenty four hours later. A little longer than I would have liked to leave it, but I had run out of holiday days! Once the second coat of POR15 had dried I then added a final layer of Hammerite to the underseal to make sure that if there were any cracks they would also be sealed as well. The overall effect was an application of black preventative paint. 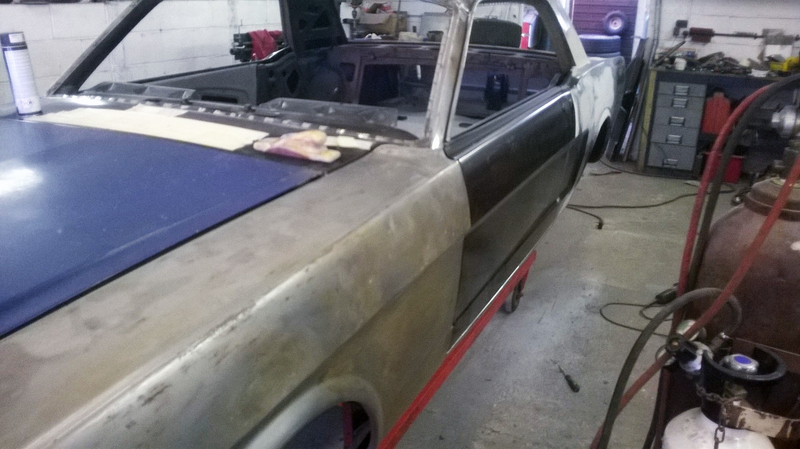 Once I had completed the inner work of the panels it was taken to Mustang Maniac ready to be fitted at a later date. The fender would be fitted up against the body work at a later date. The fender needed to be stripped back to bare metal from the outside to see if there was any holes of dents in the metal work. The fender was mounted on a stripping frame and plenty of stripper, wire wool, scrappers, sweat and aching joints later this was the result. Although the metal looked OK and cleaned up well there was plenty of filler in the panel just over the wheel arch that had stretched the fender and was now week, this resulted in being able to pop in and out the metal depending on what side you pressed it from. The panel was fitted up to see what it would look and hold like on the car. This would have a catastrophic effect on the look of the paint. So after all that – it was replaced with a new one! I was a little disappointed with the fact it had been scrapped with the hard work on the inside as well as the outside being a waste of time. But in the long run it would be best. The very back of the fender to the door didn’t fit very well so a cut and rebuild had to be made to get the gaps correct.